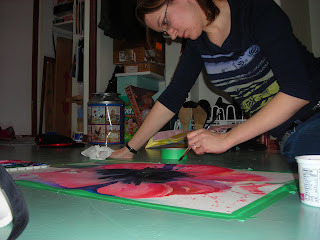 I worked some more on my "Killer Poppy" painting today. I may be going a little nuts with the "bloom" effect, but I think after multiple glazes are applied it will work. For some reason, I want to use a lot of ultramarine blue in this painting. 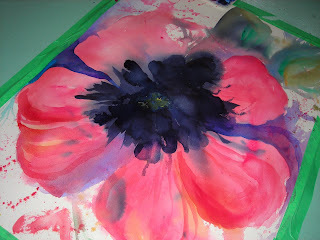 I had to pick up a tube of Winsor & Newton Cadmium Red Deep, since no poppy with any dignity is primarily magenta! 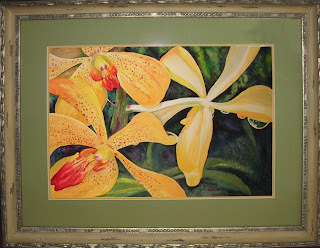 I also picked up my Freckled Orchids painting from the frame shop today. It is the most I've ever paid for framing, but it is stunning. 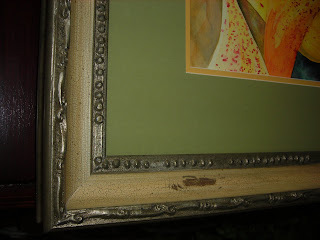 I absolutely love this frame, it is antiqued silver around the edges, with buttery crackled paint between, distressed and aged, and as you can see, the painting looks great against the "barrister white" paint of our main floor. I will be entering this piece in the Peace Liard Regional Juried Art Exhibition in March, if it doesn't sell before then. 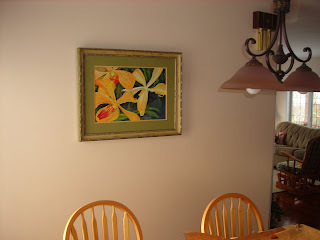 And I'm not trying too hard to sell it - it just looks too nice in my home! I believe that my last glaze is dry enough for me to continue making my poppy a killer, so off I go!